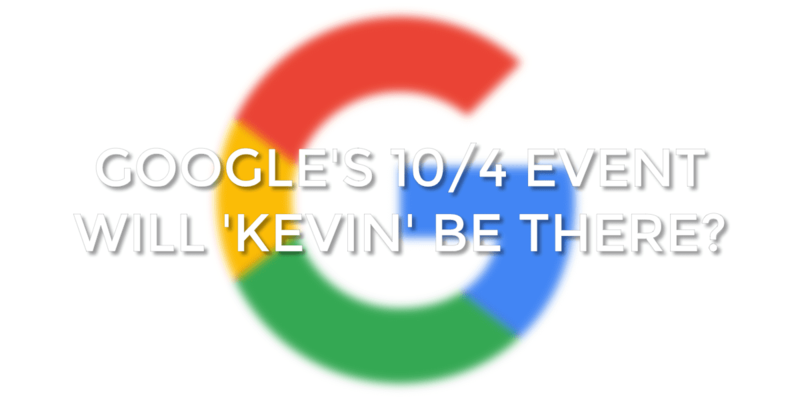 Could We See A ‘Kevin’ Pixel Announced at Google’s Upcoming 10/4 Event? First off, let us file this firmly under speculation and speculation only. While we love to dig for hard facts and make our news about uncovering upcoming Chrome OS devices and services, sometimes we just have a feeling about things. You can call it a hunch. A gut feeling. Whatever works best for you. Any way you label it, we have a feeling that something really cool might happen at Google’s upcoming event on October 4th. Anyway, there have already been a few leaked details about this event that have been discussed here and elsewhere: Pixel Phones (not Nexus), a new Chromecast, Google Home, Android Daydream VR hardware, and…more? Again, all this is based on a couple un-named sources, so keep the salt handy. There are instances aplenty of ‘should’, ‘maybe’, and ‘could be’ littered through all these posts. What we know, think and hope for is all a bit murky at this point. Based on our previous post about ‘Kevin’ having a possible release window, we’d like to offer the possibility that an announcement (not a release) of ‘Kevin’ could feasibly happen at this upcoming event. Hear me out. Acer announced the Chromebook R13 at IFA 2016 on August 31. That announcement was paired with an availability window of ‘October’. That gives a 5-8 week announcement to release window. With our story about ‘Kevin’ having a release window around Chrome OS R54 (available somewhere from mid-October to late November), it would fall in the realm of possibility that Google could announce ‘Kevin’ in early October (10/4) and slate it for release firmly in November. The timelines match up perfectly. No, you didn’t miss anything. Back to that gut: while we have no firm proof that ‘Kevin’ is going to be a Pixel device, we just have a feeling. There haven’t been any commits we’ve seen so far that point to any manufacturers. None. Unlike, say, ‘Cave’ where we see clear reference by ASUS email addresses in the commits left and right. And for ‘Elm’ (which is the Acer Chromebook R13) we saw commits from folks at Quanta, Acer’s manufacturer. While this wasn’t clear to us at the time, it was at least a clue to who ‘Elm’ might belong to. With a tightly guarded manufacturing partner, we (and others, too) feel that ‘Kevin’ could be a Pixel-branded device. The only real manufacturer we see mentioned anywhere in all this is Samsung, but it is always in reference to the headphone jack or LED’s on the outer body. We firmly believe this device is not made by Samsung. The short version: Samsung makes ARM chips (Exynos line in their tablets, phones, and Chromebooks) and amazing screens for themselves and others. ‘Kevin’ will have a screen made by Sharp and the Rockchip RK3399 (ARM) processor. Those facts alone make it clear that this is not a Samsung device. So, all that being said, if ‘Kevin’ is a Pixel device, it would make total sense to see it announced with the Pixel Phones we are supposed to see. It seems that Google is ready to fully take control of it’s hardware division. So, there you have it. This isn’t fact. It simply is a possibility based on some conclusions. What do you all think? Is it possible that ‘Kevin’ might be a Pixel device? Is it possible that it might get announced at the 10/4 event? Who knows, but it is crazy-fun to consider, right?